I am always amazed at how many people have trouble cooking rice or say it's hard. Really, it's not. You boil water, toss the rice in, plop on a lid and lower the heat. Then you walk away. Watch a 30 minute TV show. Then, the rice is done. For that, I really can't justify a rice cooker. Last year, when we moved in to the house, we didn't have a stove for several weeks. We had to wait for the city to pass off the inspection of the gas lines before it could be turned on. There's only so much cooking on an electric skillet and the grill you can do before you go crazy. The last resort was breaking out the crockpot. Maybe that should have been my first resort. It was August. We didn't have air conditioning either. And we were moving. My brain wasn't exactly functional. That's when I discovered you can make rice in the crockpot. It takes about 2 hours, but it's does have all the ease of the rice cooker without another appliance taking up very limited space. This has been a total life saver for me this school year. Five kids in five different schools! I get in the car around 340 and sometimes don't get home until after 5 pm! And that's just bus pickup. Then, we race home for dinner and homework. Wednesday nights are activities at church for the older kids. Out the door for that by 620. Wednesday night has become crockpot night. Even if it means taco salads over rice instead of chips. That's what we did last night. 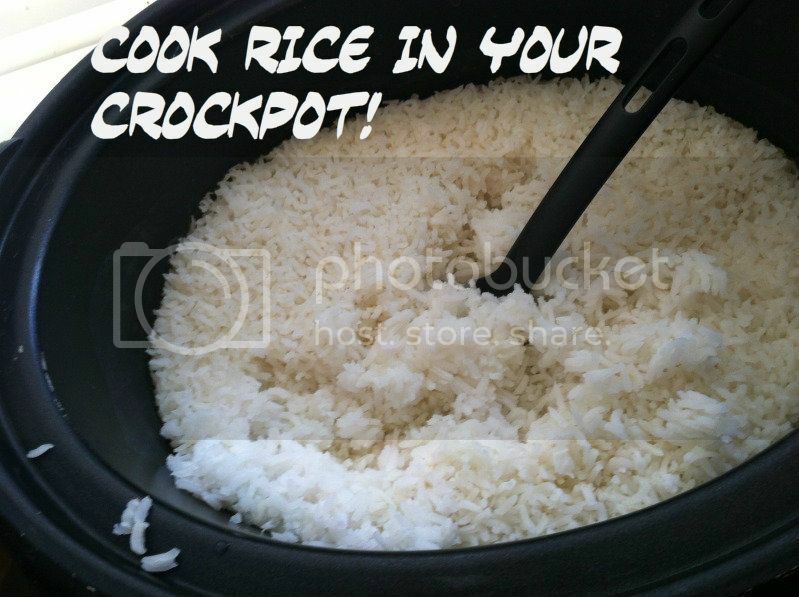 Measure out your rice in to the crockpot. Add twice as much water. Turn your crockpot on high for two hours. Someone asked for a bit more clarification. When I cook for my family, I have a 7 qt crockpot. I use 3.5 C rice and 7 C water. You probably wouldn't want to do that much in a 4 qt crockpot. For a smaller crockpot, I'd do 2 C rice and 4 C water. This is great for those crockpots with the timer feature, that will turn on for you. Set it and forget it. My crockpot goes to a warm feature, so I don't have to worry about it burning if I'm not there to turn it off. This is awesome! I never thought to make rice in a crock pot. Do you think brown rice would also work? Interesting. All of my crock pot cookbooks have said you can only use converted rice in a crock pot. How do you do it? What a great idea! My sister-in-law has been raving about her rice cooker for years. Really...how different is a crock-pot from a rice cooker. I'll have to try it. thanks for sharing! Perfect!...gotta try this for sure. I never even thought to try it in my crockpot. I do have a rice cooker, but it has teflon, which I hate and want to get away from using. Have you tried it with brown rice? I'm going to try this today and I was wondering what type of rice you use? I usually just use a long grain rice. Totally needed this! I don't have a rice cooker but wanted to get one... now I don't need to! Love it, thanks! Trying this VERY soon! You are a featured favorite this weekend on Saturday Show & Tell at Cheerios and Lattes! Thanks again for sharing last week! Hope to see you this week! What a great idea! I had no idea that rice could be made in a crock pot. Thanks so much for sharing with this week's Throwback Thursday party.